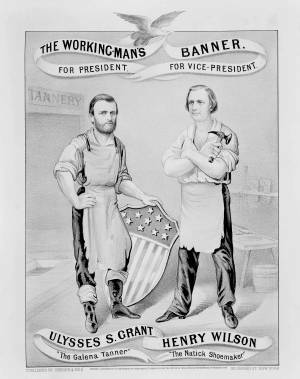 A Republican campaign banner designed to appeal to the labor vote by invoking the working class origins of candidates Ulysses S. Grant and Henry Wilson. Grant wears a tanner's apron and jackboots and holds a shield decorated with stars and stripes. He is identified as "The Galena Tanner." (See "The Great American Tanner," no. 1868-11.) Henry Wilson, who holds a hammer, is identified as "The Natick Shoemaker." (He began his career as a shoemaker in Natick, Massachusetts.) Grant stands near the door to a tannery, and Wilson stands before a shoemaker's bench.